Arizona military divorce cases can be more complicated than standard civilian divorces, as there can be a number of additional issues to consider and resolve. 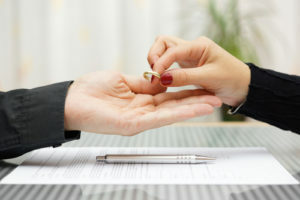 Because the outcome of an Arizona military divorce can have far-reaching, important impacts on people’s future, it’s crucial that members of the military who will be going through a divorce, as well as their partners, trust their cases in the hands of an experienced Arizona military divorce lawyer like Karen A. Schoenau. For more than 35 years, Karen A. Schoenau has been providing her clients, including members of the U.S. military and their partners, with the highest-quality legal services in their divorce cases. She has the experience, skills, knowledge, and integrity you can count on to help you successfully and efficiently resolve your Arizona military divorce. Serving a spouse active in the military – Active members of the U.S. military must be personally served with a summons and copy of the divorce petition. If the divorce is not contested, the partner in the military can sign and file a waiver affidavit to alleviate the need of being served. Protecting members of the military from “default” – The Soldiers and Sailors Civil Relief Act allows divorce cases to be postponed for the duration of active duty and for as much as 60 days after this period ends. The purpose of this statute is to prevent active duty members of the military from being held in “default” and to prevent them from being divorced without their knowledge. Military retirement benefits – Per the Uniformed Services Former Spouses’ Protection Act (USFSPA), a civilian partner in a divorce will only be entitled to a portion of military members’ retirement if the marriage lasted for at least 10 years while the other partner was serving or active in the military. Payment obligations for members of the military – Arizona divorce laws dictate that child support and spousal support (or alimony) payment obligations cannot be greater than 60 percent of a military member’s income and allowances. Depending on your situation, there may be other important considerations to be aware of for your Arizona military divorce, and consulting an experienced Arizona military divorce lawyer like Karen A. Schoenau can help you be informed and ready to proceed with ending your marriage. To get answers to frequently asked questions about military divorce in Arizona, click here. Do you need help with military divorce? If so, you can rely on Scottsdale military divorce attorney Karen Schoenau for honest answers, effective representation, and the best possible outcomes to your case. Since 1987, Karen Schoenau has been committed to helping people resolve their important family law matters, including complex military divorce cases. To receive professional advice regarding how to proceed with your Arizona military divorce, schedule an initial consultation with Divorce Attorney Karen Schoenau. You can set up this meeting by calling 480-467-3435 or by emailing us using the contact form.